Mass. NOW's event "I Heart Equal Rights" is NEXT TUESDAY, February 28th here in Boston (just a week from today). Mass. 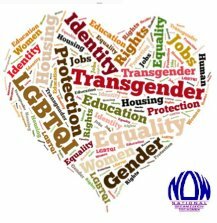 NOW is the MA chapter of the National Organization for Women, and this year's event will celebrate the passage of the MA Trans Equal Rights Bill and honor the Massachusetts Transgender Political Coalition's Executive Director Gunner Scott. This is a fundraiser for Mass. NOW and includes light refreshments and a silent auction.